Wall Street Listening Post installed at Wall and Penticton. Photo: Krystle Coughlin. Collaboratively written and designed, this project of listening scores emerged from a shared walking practice with frequent collaborator Matthew Ariaratnam. Installed at five sites along Wall Street in Vancouver, BC, each sign provides a set of listening instructions to be followed, pondered, or ignored. 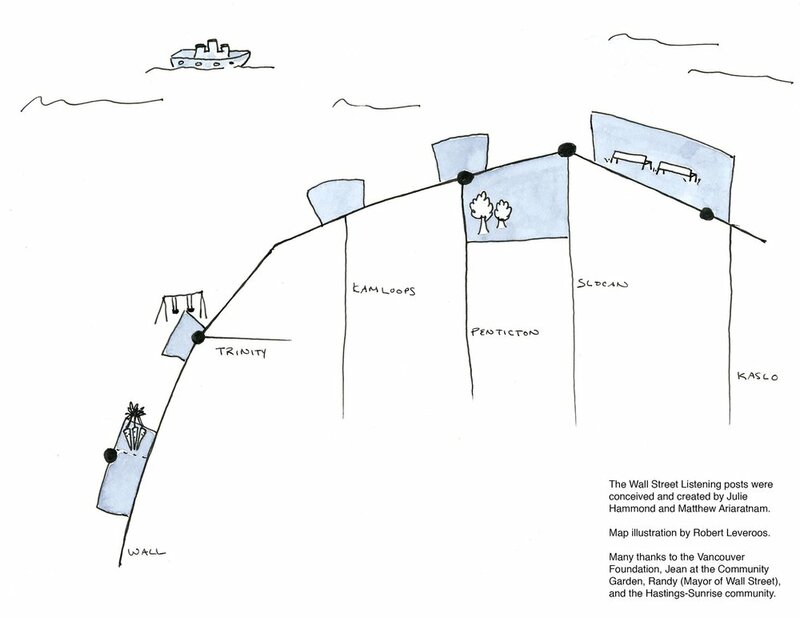 The Wall Street Listening Posts ask neighbourhood residents and visitors to engage with place beyond the eyes. Learning how to experience location through a variety of sensory perspectives is a practice of empathy, one that prepares us to engage with a range of perspectives (sonic, olfactory, tactile). When we understand that there are many views (or sounds or feelings) of the same place, we increase the possibility that we will understand our neighbourhood, our neighbours, and ourselves. In early December, we held a community walk to welcome the Listening Posts to the neighbourhood. Tea and snacks were shared, map booklets were distributed, and sounds were explored together. Special thanks to Jean at the Wall Street Community Garden! Creation and installation of the Wall Street Listening Posts was made possible in part by the Vancouver Foundation Neighbourhood Grants program.